Pikachu and the others have been turned into full 3DCG!! Mew appears in this summer's new Pokémon movie, the one that currently has everyone's attention! What is the connection between Mewtwo and Mew...?! 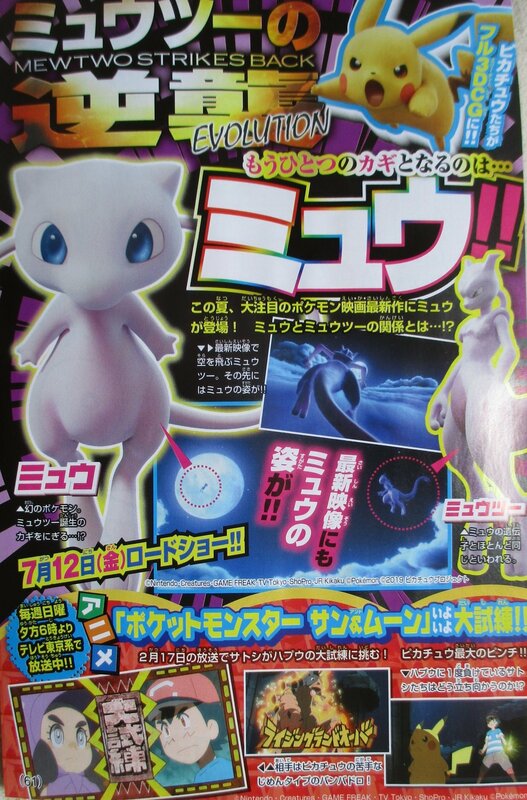 Mewtwo was seen flying through the sky in the teaser trailer. And Mew could be seen in front of him!! Mew appeared in the teaser trailer as well!! Mew: A mythical Pokémon. It's a crucial key component in Mewtwo's birth...?! Mewtwo: It's said to have almost the exact same genetic makeup as Mew. Anime: At long last, we get a Grand Trial in "Pocket Monsters Sun & Moon"!! In the episode airing February 17th, Satoshi attempts Hapu'u's Grand Trial! Pikachu is in bigger trouble than ever before!! *How will Satoshi and Pikachu fight against Hapu'u, who they've already lost to once before?! *Their opponent is a Banbadoro, who's a Ground type: Pikachu's weakness!